It’s an hour after lunch and I’m sitting in the midst of chaos. Charlie’s Grind and Grill is the newest burger joint in Metro Manila. And like some of the newer establishments, this restaurant suffers from a fortunate conundrum: popularity. Because of certain food writers (no names but you know who you are), there has been a tsunami of guests flocking to this little eatery. Obviously caught flatfooted by this sudden influx, the front-of-the-house staff (who, by my count, were a grand total of two) are simply overwhelmed. Getting an open table is slow. Ordering your meal is even slower. If you choose to visit Charlie’s, especially on a weekend, be prepared to wait. With that said, let me just say that your patience will be well rewarded. Their menu is limited, serving what many would consider bar chow. While Charlie’s highlights their Black Angus Burger (P175, with fries), I’m here to indulge in another item, the Philly Cheesesteak. 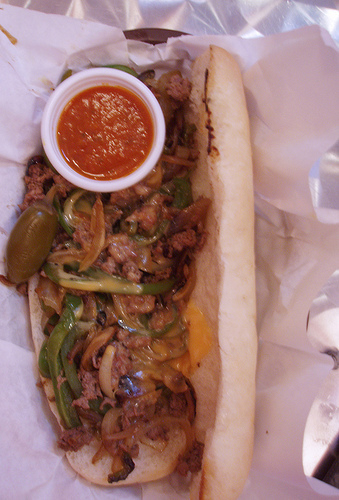 For the uninitiated, a Philly Cheesesteak is a simple sandwich of thinly sliced beef topped with melted cheese and served in a long warm loaf of Italian bread. Depending upon the purveyor, the ingredients may vary, from the cuts of beef, to the choice of cheese (or cheese substitute) or even whether green peppers, caramelized onions or sautéed mushrooms are added. Charlie’s Cheesesteak (P220, for the smaller size) is made up of fine cut Batangas triple ‘A’ sirloin, a mix of green peppers and onions and a topping of cheese sauce. While I usually like my Cheesesteaks on the simpler side (beef, Cheez Whiz and a bun), I decide to keep to the menu and not ask for any alterations to my sandwich. The works, please. My sandwich arrives in a simple paper-lined basket. What first hits me is the smell. As the steam rises from my freshly made cheesesteak, the aromas of caramelized onion, sautéed green peppers and seared beef fills the air. I’m beginning to drool, anticipating my first taste. A bite is messy, yet scrumptious. The tastes and textures are distinct. But everything from the delicate crunch of capsicums to the brown-sugar sweetness of the onion to the creamy cheesiness of the cheese sauce comes together to underline what is most important–the juicy, fatty flavor of the beef. With every bite, more cheesy beef falls out my warm hardy roll. Luckily I have just enough bread to mop every stray morsel from my basket. This is my idea of finger-licking good. Charlie’s Philly Cheese is a gloriously delicious mess–a mess that I am more than happy to clean up. PS. There is a car wash beside Charlie’s. Clean your car while chowing down on a burger followed by an ice-cold beer chaser. That’s my kind of multitasking. Actually Katrina, there is a lot of cheese sauce under that tangle of beef. Personally, I think Charlie's is better than Elberts...But I also could have been all the beer I was drinking. :) Charlie's has a great choice of beers by the way. From Edsa - turn on Shaw Blvd going toward C5. Once you reach a rotonda on Shaw turn right in between a BPI and a Petron. You are now entering Barrio Kapitolyo. Turn left at the second intersection and you should see Charlie's on your right. Hello Anon. That's terrible to hear. I hope you complained. You should always get your money worth. Heard of this place from my cousin -- she also said the food was good but the place was understaffed...I'll try it soon! We've been hearing good things about Charley's from other folks who live in Kapitolyo. The other place getting good buzz is Chi's (pizza) over in Paranaque. I hope they both figure out a way to serve good food, with decent service. hi franco, i was there a few weeks back and the lady staff (must be the one you were referring to) looked overly apologetic for the long wait i had to have my dinner. i do hope theyre able to manage the place well, the food is too good to get bad publicity because of the service. Reading this I'm thinking I definitely need to get more cheesesteaks from Pat's and Geno's before I leave Philly! Each 12-inch sandwich is supposedly 1200 calories by the way, so approach with caution.